This 5 day intense course will be kickstart to a successful career in the coffee industry. You will learn everything about the origin and business of coffee and will walk away as a true Barista. Equipment Introduction | An in-depth discussion on all the equipment a barista uses, including the toolkit (barista kit), espresso machine and bean grinder. Milk Preparation | Learn the key techniques to preparing micro-textured milk, applicable to every espresso-based drink. 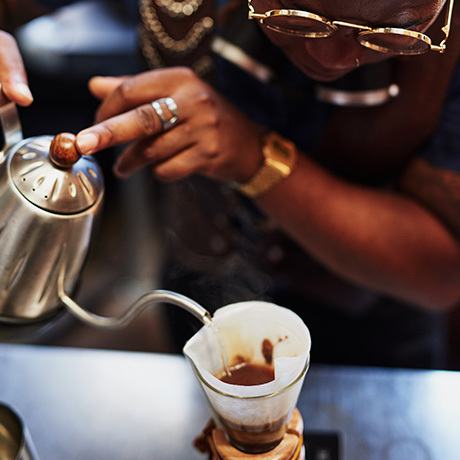 Presentation | Learn the importance of presentation standards when preparing your coffee including latte art demonstration. “Great presentation equals great coffee”. Drink recipes | A comprehensive guide to preparing all the espresso-based drinks on a typical barista menu. Assessment | On the final day of the course, there will be a written theory test and a practical presentation which will be graded by the trainers. Certification will be provided should the assessment be passed with 85% or more.